Mark your calendars, folks. The first episode of BBC’s Radio Four and the British Museum A History of the World in 100 Objects debuts tomorrow. That’s already today for those of you across the Atlantic. The theme of the first 5 episodes is “Making Us Human” and they covers objects that define us as human, made between 2,000,000 and 8,000 B.C. Tomorrow’s inagural object is the Mummy of Hornedjitef. 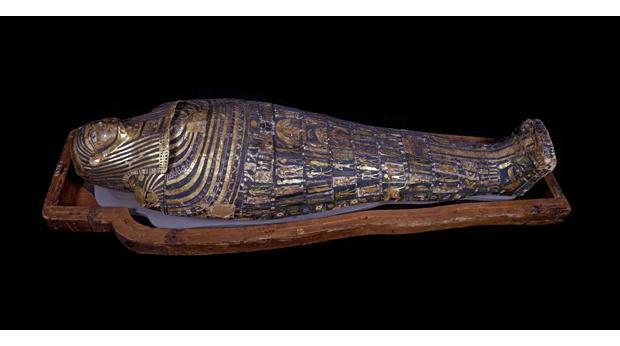 This is the mummy of Hornedjitef an Egyptian priest who was buried in a coffin, within a second, outer coffin. Examining his body using CAT scans and X-rays revealed that he suffered from arthritis and osteoporosis suggesting he was a mature man when he died. The embalmers have placed four packages inside his torso, probably his lungs, liver, stomach and intestines. He lived over a thousand years after Tutankhamun and Ramesses the Great at a time when Egypt was ruled by Greek kings. There’s tons of information on the brand spanking new website on each of the 99 objects that have already been selected for broadcast. For those of us out of Radio Four’s range, the programs will be posted as podcasts. The website also has a neat feature where individuals upload objects of their own and explain their significance. Just get a good quality digital picture and click the yellow Add Your Own Object icon in the upper right of the page. A moderator will check to be sure it’s not pr0n then approve it. You can view all the images in the series plus the ones uploaded by individuals and find out more about them using this Flash map. Click on Contributor in the menu on the left and choose Individuals to see only the pictures uploaded by people. The radio program is just 15 minutes a day, but I’ve already spent hours browsing the site. It’s addictive.